The Toys R Us store location in Springfield, Illinois. The Toys R Us in Springfield sits across the street from a closed Office Max. The remaining marks from the letters that once announced the office supply store are now only outlines on the concrete building. The shuttered store could soon be the fate of the toy store and companion baby store. 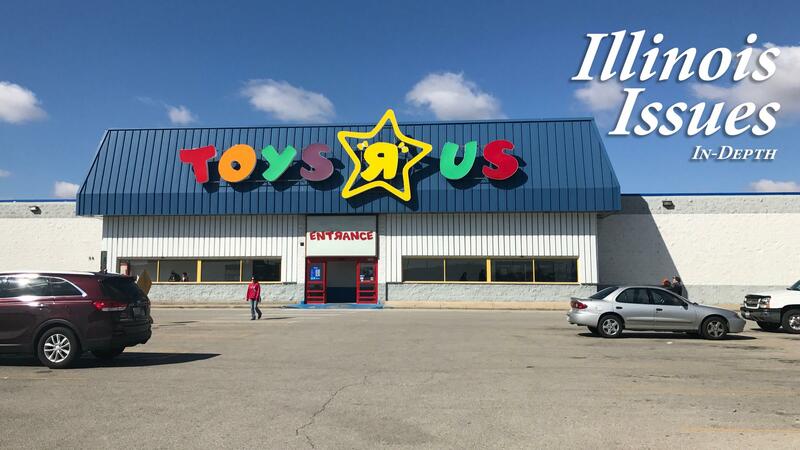 News broke last week that Toys R Us is set to close hundreds of stores across the country, which could include 31 of the toy stores and its sister outlet, Babies R Us, in Illinois. It's the latest in a string of retail chains downsizing or going out of business altogether. Others include Sears, Sam's Club, and most recently Carson's. They've left behind hundreds of workers. Last year, a little more than 2,000 people filed unemployment claims after getting laid off from a retail gig. That's down from a peak of more than 7,000 in 2009 during the Great Recession, according to numbers from the Illinois Department of Employment Security. At a time when the economy is growing, the trend has left some to wonder why. "Here we are in a period of good economic growth and yet stores are closing," said Christopher Merrett, director of the Illinois Institute for Rural Affairs at Western Illinois University. "That suggests that retailers like Sam's Club are rethinking how retail happens." The rise of online shopping means retailers are changing their businesses models, shuttering bricks-and-mortar stores and focusing on clicks, Merrett said. One example is Sam's Club. The subscription wholesaler, which is owned by Walmart, announced in January it would close dozens of its stores nationwide, including seven in Illinois. The superstore has promised a few of the Sam's Clubs around the country will be converted to online fulfillment centers. There hasn't been any indication if the centers will be in the Prairie State. The shift to e-commerce is just one factor to blame, said Rob Karr, the president of the Illinois Retail Merchants Association. Many chains overbuilt, fueled by low-interest rates and private equity firms that thought retail could only expand. The industry is now correcting itself by closing some stores. Illinois is following a nationwide trend, Karr said. But in a state that continues to see residents move out, it's a little worse off. "Our population is contracting," Karr said. "We lose every time somebody leaves the state, they take with them their disposable income and their sales." It's not only residents Illinois is losing. With the shift in retail, there are thousands of lost jobs. There is some safety net in the state. Workforce centers across Illinois offer training programs and help workers who've been laid off apply for benefits. The Chicago-based National Able Network, a nonprofit helps get people back to work, has offices around the state. It offers training programs, resume help and other resources. But that task is getting tougher, said CEO Bridget Altenburg. "As the economy improves somewhat overall, the people that are getting left behind are people that need more help. They have more significant barriers to employment," Altenburg said. "They may have education, literacy, technology gaps that are harder to overcome." That's often retail workers. The network trains clients for other types of jobs that are in-demand, in health care, transportation and logistics, and information technology. Alfred Thompkins went through an information technology training program with the National Able Network, and now works as an independent contractor. He spent more than a decade working at Walgreens in the Chicago suburbs before losing his manager's job there. He has some advice for young people working in retail now. 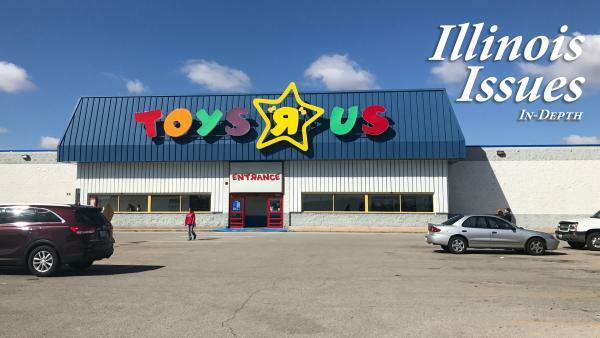 "Don't necessarily look back and think, 'Ok, Toys R Us closed, I'm no longer working here, I now need to find another retail (job),'" Thompkins said. "I wouldn't necessarily limit it like that. I would actually avoid that." Retraining and a new job worked out for Thompkins. Meanwhile, on a macro-scale, some warn Illinois may not be ready to pivot as easily. Illinois is well positioned to attract more fulfillment centers to serve e-commerce business and replace some of the lost retail jobs, said Bob Bruno, a professor of labor at University of Illinois Urbana Champaign. Its location in the middle of the country, its infrastructure and trained workforce are all advantages. But prolonged political battles over the budget and underfunding of education at every level, elementary, high school, community college and university, hold the state back. "Any continual difficulty in making those kind of investments will slow down or will make it difficult to take advantage of what are some really good fundamentals," Bruno said. Bruno and others predict Illinois will see more closings and layoffs in the months ahead. Correction: Bridget Altenburg is the CEO of the National Able Network. A previous version incorrectly stated she is the COO.